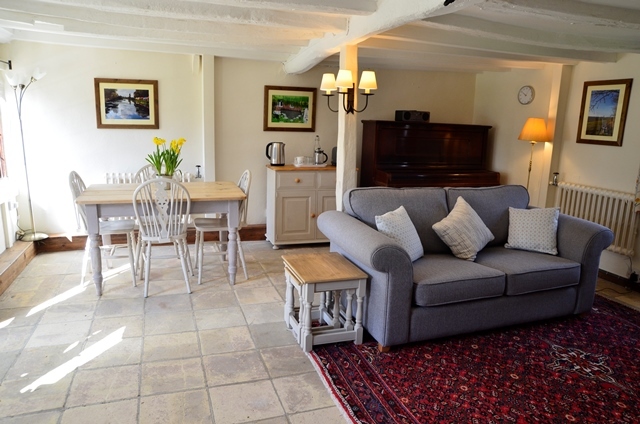 Whether you book one room or two, the 2 bedrooms, bathroom and private breakfast room/sitting room with log stove are reserved exclusively for you. The guest accommodation is self-contained, located at the end of the west wing of the house with its own private entrance and staircase, and with no occupied adjacent rooms you can be assured of your privacy and peace and quiet. The accommodation is family-friendly. For information about garden facilities, please see Activities. For more photos of the house, garden and accommodation, please see the Gallery. A cosy but spacious room looking onto the garden with sofa, rocking chair and bean chair, log-burning stove, fridge with freezer compartment and ice tray, mini-bar (soft drinks and snacks), microwave with grill, kettle and toaster, along with a wide selection of tea and coffee, including a cafetiere and seasonal fresh garden herbs for tea. Crockery and cutlery are also provided. There is a TV with Freeview and DVD player, and a digital/FM radio with CD player and Bluetooth capability so that you can bring your own music. Books, magazines, DVDs, games and maps are available in the bookcase just outside the door. Breakfast is served here in the morning at a time of your choosing between 7am and 11am. The natural beauty and unique character of each room need little enhancement. 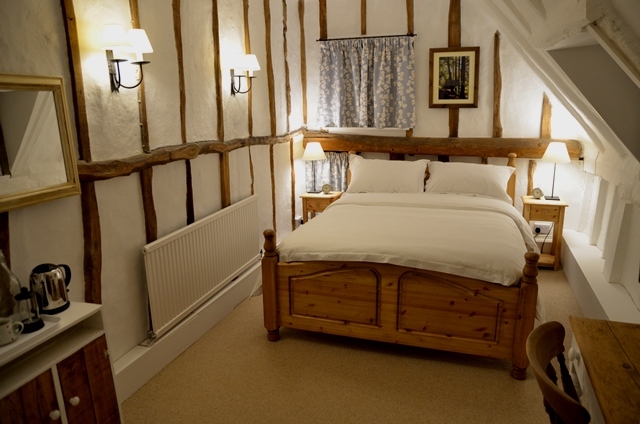 Both bedrooms boast locally handmade furniture and furnishings; luxury mattresses handmade in the UK; hypoallergenic pillows and duvets with silky Egyptian cotton bed linen; alarm clocks; TV with Freeview and DVD player; and tea and coffee-making facilities. The curtains have black-out lining to help you have a lie in, and an electric blanket and hot water bottles are provided for you to get extra cosy in winter. A double room with king-size bed at the end of the house with a special feature: the only remaining mullion window in the house. Please note that due to the unusual shape of the doorway, this room has a heavy door curtain instead of a door. 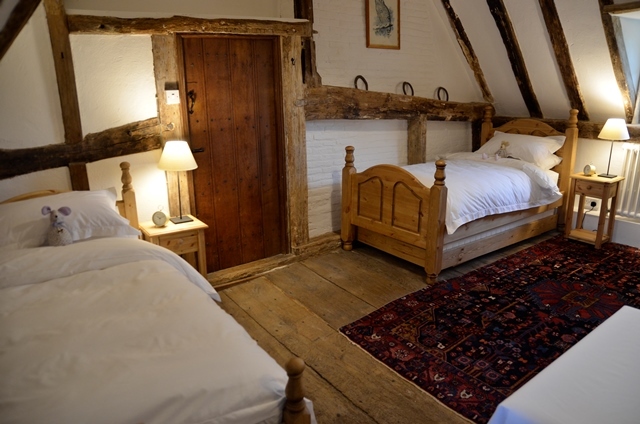 Part of the original medieval ‘hall house’, this room has a high beamed ceiling and houses the crown post that dates the house to the late 1300s or early 1400s. A twin or triple room; 2 single beds can also be converted to a super king-size bed. 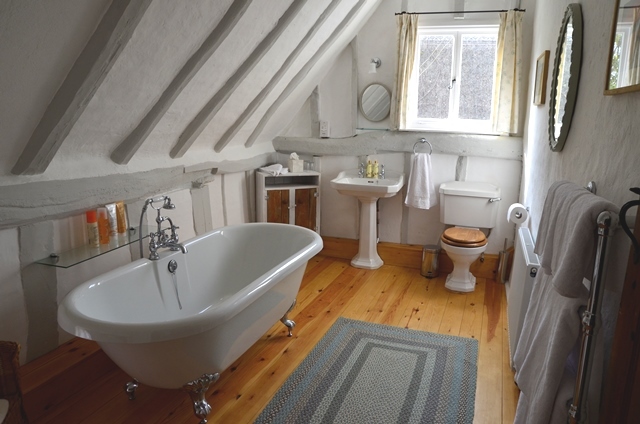 A newly renovated luxury bathroom with freestanding bath, Egyptian cotton towels, indulgent toiletries (including hair conditioner and foam bath) and other basic toiletries you might have forgotten, shaver socket, hair dryer, first aid kit and hot water bottles. Bath grip handles, non-slip mats and a foot stool are provided for those needing extra security getting in and out of the bath.